To quote popular singer Jack Antonoff, "When you go all over the world for work, you dream vacation in your bedroom". It just goes to show what bedroom means to people. If your bedroom looks anything but the peaceful heaven-like sanctum of solace that you want it to be, then there is nothing more you need. Believe us on this when we say that bedroom isn’t just a part of your house, it’s your priced belonging, a location in space around which revolves your entire universe. It’s like your Sheldon’s spot! It might seem a bit too much from our side, but it’s worth every word. Unfortunately, for most people, cleaning the other parts of the house comes first over decluttering their own bedroom. Well, priorities may vary that’s perfectly normal but what’s important is that you keep your bedroom clean and light, as in free from stuff that puts you off and your mood. And if you’re married, it gets all the more essential that you understand the importance of keeping stuff away from your bedroom rather than dressing it all up. As per the popular Chinese practice of Feng-Shui, bedroom environment plays a pretty important role in romantic relationships. In fact, there are some Feng-Shui remedies which can be really helpful for married couples. Much like any other electronic device, T.V. too creates a lot of distraction. How often have seen people staying up late just to catch the new episode of their favorite show. And if it’s Warriors vs Cavs, or the Superbowl, you’re in for an all-nighter. Serious issues like sleep deprivation have been observed by many studies with people who prefer to keep television sets in their bedroom. It’s highly advisable that you keep TV out of the bedroom. According to a study, almost 50 percent of the pet owners in the US have confessed waking up in the middle of the night because of their furry little goofballs. It’s not only about the interruption, pets always runs the risk of germs and ticks. So for the sake of hygiene, you should not keep pets in your bed. Sorry pooch, you need to keep out! How would you feel if you are asked to sleep inside a barrel? What a preposterous idea, isn’t it? Well, there isn't much difference between sleeping inside a barrel and a bedroom packed with oversized bedside table or a dresser. You need space to sleep maybe that’s why it’s called a bedroom; a room meant just for bed, nothing else. Get rid of anything that takes up a ridiculous amount of space and makes you feel strangled. Millennials these days prefer to work from bed, place where they can toss themselves some sliders, grab their laptop, and enjoy a glass of wine. A practice that’s responsible for a lot of health issues and sleep deprivation. Plus, how often have you seen people losing an important piece of document close around their bed because apparently, they were working last night. Do not make your bedroom your workstation. It is a place to relax and unwind yourself, let’s just keep it that way. Let’s look at it this way, if you’re eating in bed, it means you’re too lazy, and you’re going to spill on the sheets. Spilling leaves stains, which means laundry, extra work. And since you’re lazy, we don’t think laundry would be your cup of tea. Plus, waking up to a pile of dirty dishes won’t be the kind of start you would want for the day. So, eating at the kitchen counter or the dining area is the only option that comes to mind. A bedroom should be your cave, place where you just dive right in and hush yourself to sleep. Stuffing it with unnecessary items, artifacts, decoratives, furniture, etc., kills the soothing essence that makes it the most peaceful place in the world. 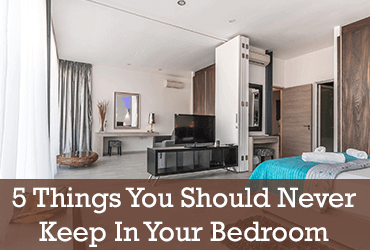 Hope you got the zest of how to keep your bedroom by reading this article.